The HaJaTec® GOLDHORN-BEEFCLUB is a private business club with an intimate atmosphere for gourmets, meat and cigar lovers, where our members and their guests can maintain connections in a confidential setting. Therefor we kindly ask you to follow the rules listed below. Our members and guests have access to the GOLDHORN-BEEFCLUB and its facilities at their own risk. The club assumes no liability for any accident, loss or injury during the stay in the club facilities. Therefore, we recommend all members a sufficient insurance coverage for themselves and their guests. Access to the club’s premises is only permitted to club members. Primary those are full members, who are in possession of a valid membership card. But also guests who have requested a free daily membership, or already have a day membership are welcome. When entering the club the card has to be shown to the doorman or the Maître or you need to verbally notify that you would like to apply for a membership now (whether a day or a star membership). After entering the club, each member will be registered. To this end the member card will shortly be read at the front desk and handed back afterwards. When the club member orders beverages or food for himself or his guests, these are posted on his membership card. Before leaving the club the membership card will be given in to the Maître, the invoice will be provided to the club member and then can be paid at the bar by cash or any credit or debit card that the club accepts. 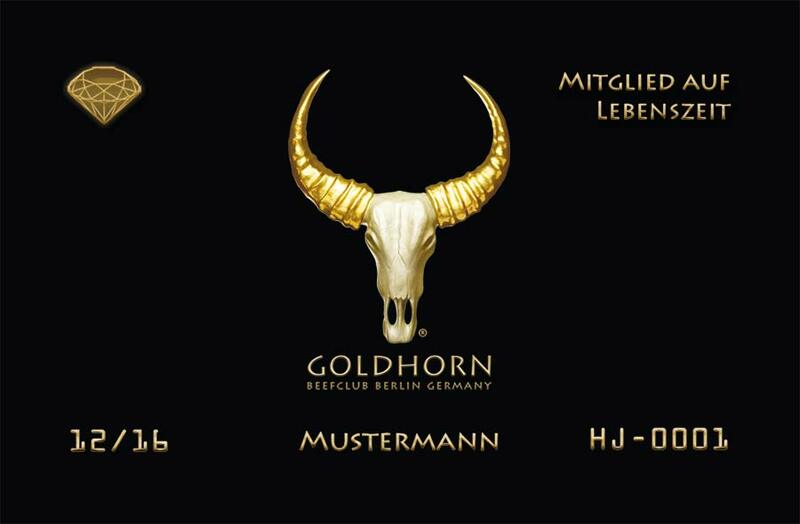 The GOLDHORN-BEEFCLUB is available for its members during the following opening hours: daily 5 to 12p.m. The terrace is open depending on weather conditions. Holidays: variable (with the exception of events). Closed: During closed or reserved events the club will be closed for all other members. Information for this will be shared to our club members via SMS, email or will be announced on our website. At the entrance area guests are led to the front desk on a Goldhorn carpet. The service person, responsible for the entrance area, checks the access authorization by showing the membership card. Only this person allows the entry. Access may be denied to members who do not have their membership card with them. In summer the cozy outdoor seating (about 80 seats), framed by a black / golden balustrade which is scattered by plants bowls with cherry laurel and a sun protective awning, invites to stay. The splash of the waterfall is calming and provides the necessary relaxation to enjoy a steak or other gourmet specialties with pleasure. Stylish clothing is expected of members and guests and is taken for granted. In the interests of the club, its members and their guests, we ask to be mindful of an appropriate appearance (business casual, no tie compulsory) and dispense with the wearing of combinations of jeans, T-shirt and sneakers. Coats, jackets, umbrellas etc. are to be handed in at the cloakroom. Liability is excluded! It is recommended to dipose discarded clothing at the wardrobe. The dining room offers our guests 3 types of tables: On the one hand there are open tables placed next to each other, a perfect atmosphere to get to know each other. In addition, there is the big club table, which is especially suitable for a group. The majority, however, consists of tables for 4 people that are using half-height modules isolated from each other, which guarantee required privacy to have discrete conversations. We offer our club members and their guests a one of a kind atmosphere with top quality of products and excellent service. The concept, the preparation and the technique of individual dishes were created by HaJaTec®, are patented and thus most unique and special worldwide. The emphasis is clearly in the cooking of the best meat - the oldest cooking method meets the oldest foods in the world. We treat our club guests to some fine food at the highest level. We offer our club members in addition to the known ("dry aged") variety of steaks also the most expensive steak and gourmet fish in the world. An absolute highlight is the unique table skewer with refined meat compositions. The whole offer is round off by the particular kind of grilling premium burger, which are combined with a variety of delicious specialties. To offer our guests a maximum of quality, individual dishes require some time of preparation. We kindly ask for your understanding that one or the other dish may take a little longer. The show kitchen is an open kitchen with a characteristically ambience. The club guests have the opportunity to watch our grill masters and the kitchen crew directly at work and will be treated to a variety of delicacies. Registrations and cancellations for our club events, such as dinner talks can only be accepted in written form by email or fax. Other reservations will be disregarded. Confirmations are usually made via SMS or email. As a matter of course, we will inform you immediately if your commitment for an already fully booked event can no longer be accepted. When space is limited, the order of receipt of reservations decides. Failure to written notification in advance will result in application of "no show fee". Please understand that reservation cancellations will only be considered if they are received in writing in the management within the period specified in the notice. 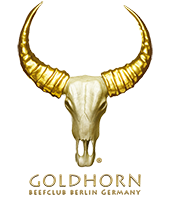 The Goldhorn-table is in a separate room, which is delimited by the maturity cupboard. The focus is on an imposing long oak table with high-backed leather chairs. This room is eminently suitable for small parties and conferences. The space can also be reserved day-time. An exquisite bar with the best selection of wine, premium beverages and fresh cocktails calls after dispensing of the wardrobe to an appetizer or cocktail before the start of your stay. You reach the noble and generous smoking lounge (including humidor) separately from the main entrance. Various arranged sitting accommodations for personal and professional discussions create a cozy atmosphere. Comfortable leather trimmings and a style fireplace make the stay a pleasure. There are also regular events planned in the club during the day. In addition to hosting many seminars on various topics such as beef, wine, cheese or whisky, we also offer workshops, cooking and grilling courses. We also offer the club-product partners to use our club to present their products at presentations, tastings or exhibitions, for optimizing their customer connections on site, as well. In addition to open events (for members) there also will be private events. Many of our lusciousness are also for take away for our club members. If requested we also deliver all delicacies with our club-home service directly at home. Whether if its noble ham, meat, cheese, wine, champagne, beer, sausages, caviar, lobster, salmon, spices, salts or cigars through to charcoal, we deliver! The toilets are the "calling card of the house," they say. For this reason, we designed the toilet facilities very expensive and classy and equipped them with a variety of accessories. Besides hygiene products and cosmetics an assortment of different fragrances is available for our club guest. We kindly ask and in behalf of all club members to leave the toilets clean and hygienic and to be careful with the accessories and cosmetics you have on hand. Membership benefits are annual performances and start with the admittance of the member to the club and cannot be transferred. Each club member has to pay a one time joining fee. This is used for administrative measures as well as for the club correspondence. Club memberships can be finalized in 4 different power stages - as a member card with a "24 hour day card", "1 star", "2 stars", or "3 stars". Club members can pay their bills in the following way: cash, with a credit or debit card, via invoice (corporate membership). We want to offer our club members an outstanding service. For this reason, we eminently place importance on qualified employees. If good service is rewarded with a tip, we are very grateful to all club members. The allocation is made as follows: 70% of the tips is for the respective service, including bartender. The remaining 30% gets the kitchen crew. The restaurant manager is excluded from the tip. Tip for the parking and shuttle service is shared by the drivers and security. The service person for the wardrobe is also in charge of the toilet facility. Tips abides a 100% with them. At your request, we park your car in the adjoining underground car park on reserved spaces right after your arrival at the Beefclub. When leaving the club we will bring your car in front of the door. The use of a radio as well as the consumption of own meals and drinks is not permitted in the club. Bringing pets along and their stay in the club is not allowed. The consumption of drugs (except alcohol) is also prohibited. Throughout the club photography and filming is prohibited. Photographing and reporting on behalf of the media, or to use for media is only allowed by the chairman after consultation and with written authorization. The stay in the club from 06:00 p.m. - 02:00a.m. is for people under the age of 18 allowed only if accompanied by parents. Jackets, coats or umbrellas are undesirable to take with you to the table. Premises which are intended only for staff and were also marked, access is not permitted. Club members are not entitled to stay in the club during closed events. Harassing the staff, whether oral or by an act of violence, is prohibited. Club members who have no legal capacity (intoxicated, etc.) demonstrate that access to the club premises may be denied or they can be asked to leave. If it comes to violation of any of these prohibitions, members can be expelled from the club. The willful soiling of the premises including the outdoor area is prohibited. Theft of club property and the robbing of property of other club members will lead to exclusion. All PR - technical measures as well as personal matters and results, which help the club nationally and internationally to further prestige, may be liable to an exceptional permission. Only the club president can grant permission. Selected areas of the club such as the entrance, the checkout area, wardrobe or kitchen are monitored via video and are solely for the safety of the club’s community. All personal data as well as video recordings are liable to data security and only used internally.